All our clients who start dining room projects have the same goal: more than just a functional space to consume food, they want a place to gather and connect, whether it's a casual family breakfast every morning or dinner parties with friends. 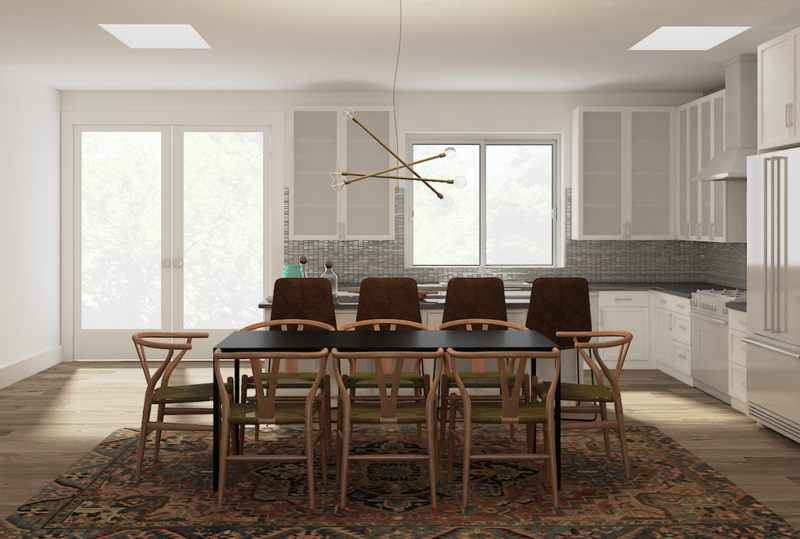 From a small breakfast nook for a client who loves midcentury modern, to a modern-eclectic design that mixes intricate antique motifs with sleek modern steel, to the new traditional dining space above which includes two of the biggest current design trends, we love these 4 dining spaces that invite you to sit down and join the table. We love this first project because it's proof that you don't need a big separate room to get a beautiful and functional dining space. The design of this space is deceptively simple but is actually the end result of careful planning to maximize the use of the space. Because the small sunlit space wasn't quite large enough for chairs on both sides, Decorist Classic designer Samantha Piane set up bench seating on one side with storage underneath. 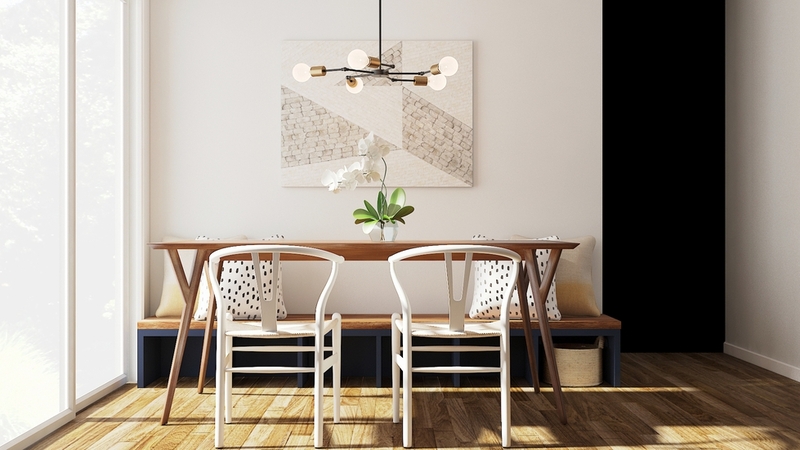 The dining table and chairs are streamlined and open to not take up visual weight, but both have a similar Y-pronged detail to make the space feel cohesive. One final touch - a 5-arm filament-bulb light fixture, a beautiful mid-century spin modern on the chandelier. Breakfast here every morning would be a great way to start the day. This dining space is proof that when done well, mixing formal and casual doesn't just work, it works beautifully. Decorist Classic designer Amanda Wegwart designed this space in a study of contrasts. While the seating-for-6 set up is formal, the open space and the wide-width shiplap (trend alert!) 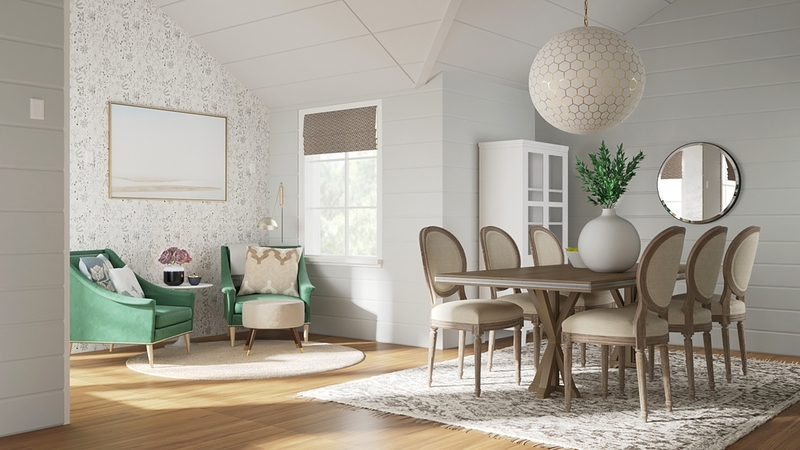 help to keep this dining area casual enough for everyday use. An accent wall helps to break up the paneling and is a focal point for the adjoining seating area, while the high ceilings above the table showcase a large-scale capiz shell and gold honeycomb lantern. Finally, in a space full of soft neutrals and textures, a pair of velvet upholstered armchairs in a lush green provide a beautiful - and very on-trend - pop of color. If you want an example of modern-eclectic design, this dining space below is the very definition of the style done well. Decorist Elite designer Anna Smith defined this dining area within a large and open concept living-dining-kitchen space with a gorgeous and intricate Iranian antique Heriz rug and an ultra-modern brass rod hanging light fixture. She then paired a long and sleek black recycled steel table with limited-edition chairs with curved wood and hand-woven seats. Not many people would have the vision to see that these items would mix well together, but then again, not many people have the modern-eclectic design skills of Anna. This client had just purchased the salvaged wood trestle table but didn't know how to decorate the rest of the dining area around it. Enter Decorist Classic designer Ellice Condon, who immediately saw that the large scaled wooden table needed contrasting chairs and fixtures to prevent the room from looking too rustic. The solution? Industrial-style metal chairs and a curved metal chandelier, both in black. And as a final contrast to the heaviness of the wood and metal, striped curtains with pom-pom tassels for a little whimsy and flair.